I’m proud of myself this year for getting a head start on my Christmas shopping. It’s not only been less stressful, but it also is spreading the cost over time. It doesn’t seem to hurt as much compared to when you drop a big lump sum over a very short period of time. I’ve done a mix of shopping locally and in Ottawa and buying gifts online. Personally, I prefer shopping online these days. The gifts arrive right to my door and I don’t have to brave the holiday crowds of people. Plus, I have access to many, many more stores! Where I currently live is limited in selection of stores. 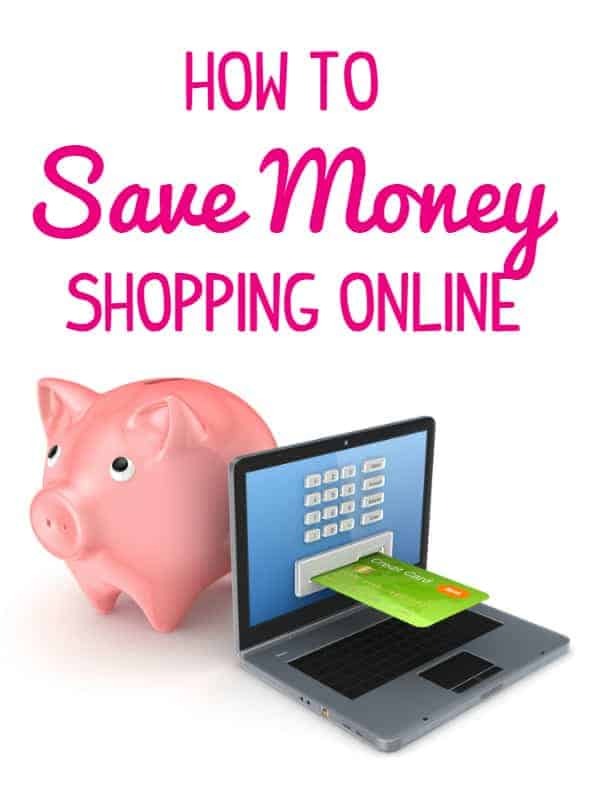 What I wanted to do to today is share a tip with you on how to save money shopping online. You just have to remember to do this BEFORE you buy to benefit! It’s easy once it becomes a habit. I’ve done so much online shopping in the past and am kicking myself for not doing this before! My tip is simple: Go to Ebates FIRST before you shop online. Why should you do this? Because you get paid $$$$ to buy online for stuff you were going to purchase anyways! You might as well get some money back for doing it. 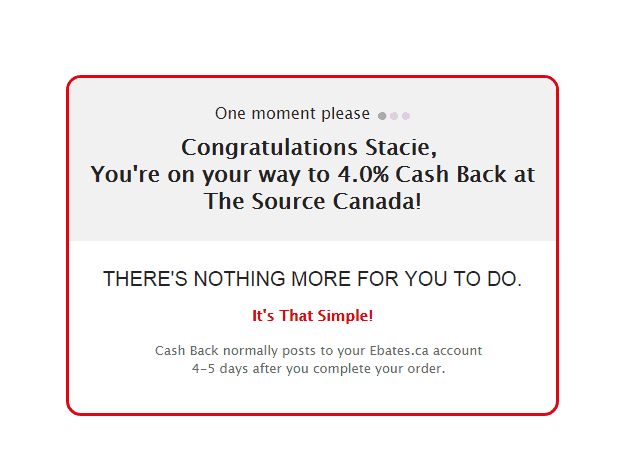 First you need to sign up for Ebates Canada. It’s free. Then when you are ready to purchase login into your Ebates account and find the store you want to shop on by typing the name in the Search bar at the top. 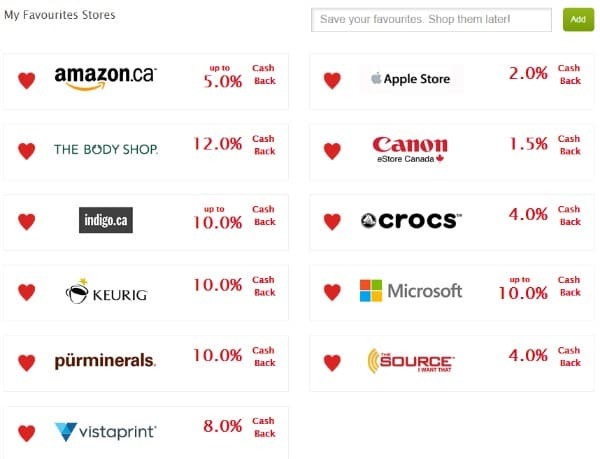 You’ll see the % of cash back you’ll earn on your purchase from that store. 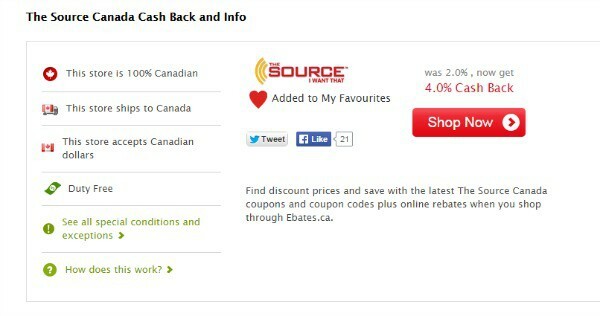 In my example below, I typed in The Source Canada and can see they offer 4% cash back on my purchase. This means that I’ll get credited 4% of whatever I buy at The Source into my Ebates account. Ebates will give you a tracking ticket so it knows when you’ve placed an order. I bought on Indigo yesterday and the cashback credit came in a few hours later. Just keep all your confirmation emails from the store for your purchase in case you need to check on your cash back credit. Four times a year or more, they’ll mail you either a cheque or Paypal money transfer, whichever one you prefer. There is no extra form to fill out to redeem your cash and it will also give you a chance to accumulate money in your account. I was blown away with how many stores were a part of Ebates! Here’s a list of a few of my faves and the current cashback they offering. It’s become second nature to me now to visit Ebates first to see if the store is listed. They have 650 stores on their site so chances are it is. Right now Ebates has even higher cashback percentages because of Black Friday. Get your online shopping done now if you can and rake up the savings! Learn how to save money on groceries too! Join the #HasbroDayofJoy Twitter Party on 12/4 at 8pm EST! Thanks for the info. I have to think of this next time I shop online. I see a few of my fave stores there! Definitely need to start using ebates! Hmmm….those rebates may be better than on the site I’ve been using for years. Perhaps I should look into this a bit more closely. Thanks for pointing it out. Going to need to start using ebates! I’ve seen commercials on tv for this I think. I wasn’t sure but that sounds like a good deal to me! I do a lot more shopping online these days so why not get some money back? I use eBates and have saved about $100 because of them! I actually just received an email saying i got cash back for yesterday’s purchase! Love it! I’m going to have to try all of these. I sure hopw they work with the stuff I buy. I have to be gluten free hopefully that kind of food is still on the saving list. I’ve been getting cheques from Ebates in Canada and United States for two years. Groupon.ca is a favourite store. I’ve heard about Ebates and I shop online a lot. I’ll have to look into the US version. Ebates is great and works in the US, too. My daughter found it and now we always check before placing orders. It’s great to see the money add up and that check come in the mail. This is great information – will have to remember it for next time – thanks! Thank you so much for this post. I have already saved it. I do not shop much online and I did not know anything at all about Ebates. I willprobably change my mind about shopping on line this year and I look forward to doing so.